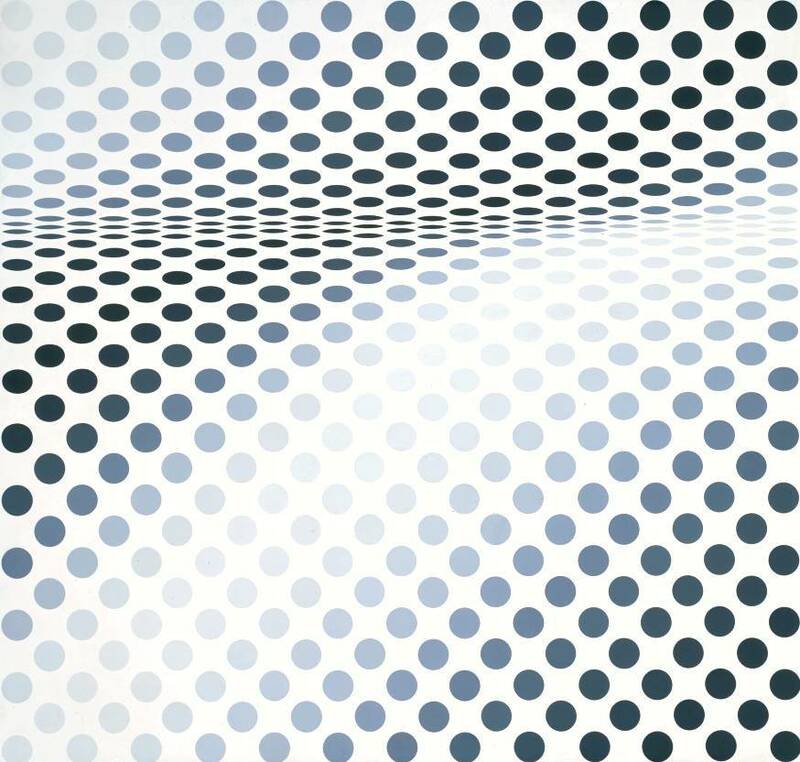 One of the founding members of the op art movement, Bridget Riley is a hugely important artist to me. Below is analysis of two of my favourite artworks of hers. Hesitate is a timeless artwork, seeming modern despite the fact it is over 50 years old. It even appears as if digitally made despite the context of production. Like a lot of op art, the formal elements are relatively simple, perhaps restrained, however, the result of the artwork lies in the eye (and mind) of the viewer. It is easy for the viewer to feel lost in the artwork, as the illusion creates multiple layers, depths, and gradients. The experience is more psychological than an appreciation of formal skill. In creating a relatively regimented, grid-like take on abstraction, Riley subverts the conventions of abstract painting. The result is an artwork that surrounds the viewer, rather than being displayed in front of them. Riley said of this work, ‘I try to organise a field of visual energy which accumulates until it reaches maximum tension’ (1). You can see what she means; by drawing a series of oscillating lines, she creates the illusion of peaks and troughs in a series of waves. Their frequency increases towards the bottom, creating a great deal of visual noise in an artwork that is already somewhat difficult to look at for too long. Her likening of the pattern to ‘tension’ is extremely apt – at the bottom of the artwork the lines seem to have almost reached the point of breaking, yet point before they do is where the artwork ends. This is another fantastic example of nothing more than a direction constituting the illusion of 3 dimensions.